Corpses mod adds an interesting feature for mobs. Now after the death of zombies will remain their corpses, of which oozes blood! The corpses will be in different positions and it is really funny mod. 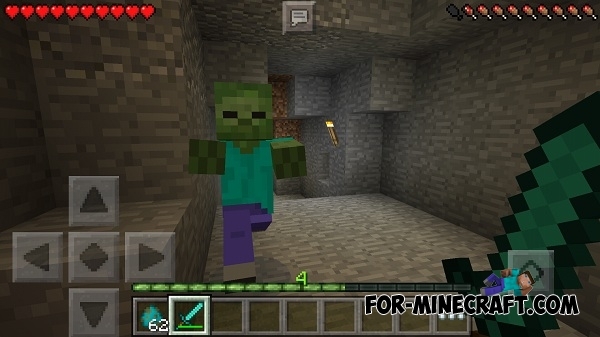 The developer will release mod updates to make the bodies of all mobs. Just kill zombies, and his corpse will appear. These corpses can not be removed. And if you kill a zombie at his home, then his body will remain. Maybe this will be fixed in the future. It looks really funny but there is a problem - you can not to remove the corpses. And if you kill a zombie at his home then his body will remain. Click on the wrench key, then "Settings" and "ModPE Script". Now click the "Add" button, find the downloaded script (mod) in your device's file system and click on it (Corpses.modpkg). Just remember one thing: This file has a new .modpkg format and it is installed as scripts. Can you do it for any other mob?